Oracle Database 11g is a comprehensive database platform for data warehousing and business intelligence that combines industry-leading scalability and performance, deeply-integrated analytics, and embedded integration and data-quality -- all in a single platform running on a reliable, low-cost grid infrastructure. Oracle Database 11g provides best-of-breed functionality for data warehouses and data marts, with proven scalability to 100's of terabytes and record-breaking performance. It also provides a uniquely integrated platform for analytics; by embedding OLAP, Data Mining, and statistical capabilities directly into the database, Oracle delivers all of the functionality of standalone analytic engines with the enterprise scalability, security, and reliability of an Oracle Database. 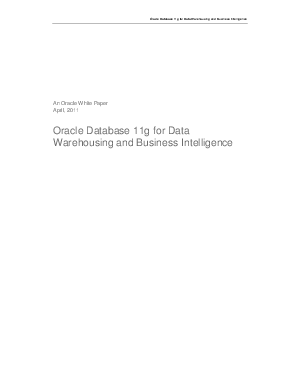 This white-paper provides an overview of Oracle's capabilities for data warehousing, including the Oracle Exadata Database Machine, and discusses the key features and technologies by which Oracle-based business intelligence and data warehouse systems easily integrate information, perform fast queries, scale to very large data volumes and analyze any data.